In the Genesis myth, Adam is living alone in Eden when, in Gen. 2:19f, God brings him every animal so that Adam can name them. This is a story that every kid in primary is familiar with. Since we’re so familiar with, I doubt any of us ever really give it much thought. But why was it important for Adam to name every animal? The first and most obvious answer is that the animals did not yet have names. But why does God have Adam name the animals? Why is it significant that the animals be named and not the plants or the inanimate objects? 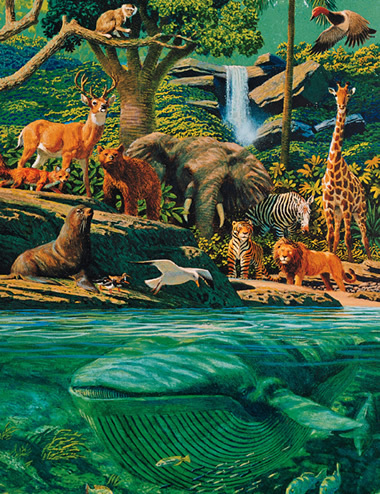 Why does God not name the animals? Genesis 2 explains how Adam receives dominion over “every living thing” — because God brings them to Adam for Adam to name! By personally giving names to each animal, Adam receives personal dominion over them, as God intended. The name is a mystical and powerful attribute in ancient thought. According to ancient Greek magic papyri, one could gain power over another by learning his name, and one could only invoke the power of a deity if he knew the true name of the deity. The importance of the name is prevalent in biblical thought as well. In the book of Hebrews, the author states that after Christ was resurrected, he was given a more exalted name to match his exalted status (Heb. 1:4). After the patriarch Jacob wrestles with the angel, he begs, “Tell me, I pray thee, thy name” (Gen. 32:29). In the New Testament, when the high priests interrogate Peter and John, they ask “by what power, or by what name” (Acts 4:7) the apostles worked, revealing that they understood the name to be synonymous with the power itself. As in Hebrews, receiving a new name can reflect an exalted status, such as in Isa. 62:2: “Thou shalt be called by a new name, which the mouth of the Lord shall name. Thou shalt also be a crown of glory in the hand of the Lord, and a royal diadem in the hand of God.” According to the book of Revelation, those that ‘overcome’ will receive a white stone, “and in the stone a new name written” (Rev. 2:17), and then Christ declares that those who ‘overcome’ will “sit with me in my throne” (3:12). Association with a name–especially the divine name of deity–also represents one’s status in ancient texts. According to the book of Revelation, the righteous will have the name of the Father written “in their foreheads” (Rev. 14:1; 22:4), a motif also reflected in the apocryphal Apocalypse of Elijah (1:9). One Gnostic Christian gospel expounds on the importance of being associated with God’s divine name: “Who then can utter his Name, the great Name, except him alone to who the name belongs, and the children of the Name, on whom the Father’s name rests, and who themselves rest on the Name?” (Gospel of Truth 38:6-41:3). According to the Gospel of Philip, the Son became the Father because the Father gave him his name (Philip 54:5-13). In the Genesis 2 account, because of the significance of something’s name, Adam giving the animals their names represents Adam’s dominion over them. Similarly when Israel conquered lands, they renamed them to show their dominion over the land (c.f. Ps. 49:11). The same motif is reflected in biblical accounts of God renaming people, although in a more positive sense — for example, Abraham (Gen 17:5) and Jacob/Israel (Gen. 32:38), and in the New Testament when Jesus renames Simon to Peter (Mark 3:16). Understanding the importance of the name–especially the divine name–in ancient thought casts new light on seemingly simple biblical accounts so familiar that we never give them a passing thought, such as God bringing animals to Adam to name. It also shows the seriousness of the commandment given to Moses not to take the Lord’s name in vain (Ex. 20: 7), as well as the Lord’s threat to blot out the names of the unrighteous in heaven (Deut. 9:14; 29:20).